TesseracT and Animals as Leaders will be joining forces for an European tour in September, October and November. Animals as Leaders are promoting their third studio album The Joy of Motion released this year, while TesseracT are promoting their 2013′s record named Altered State. Have you heard how good AAL’s new album is? 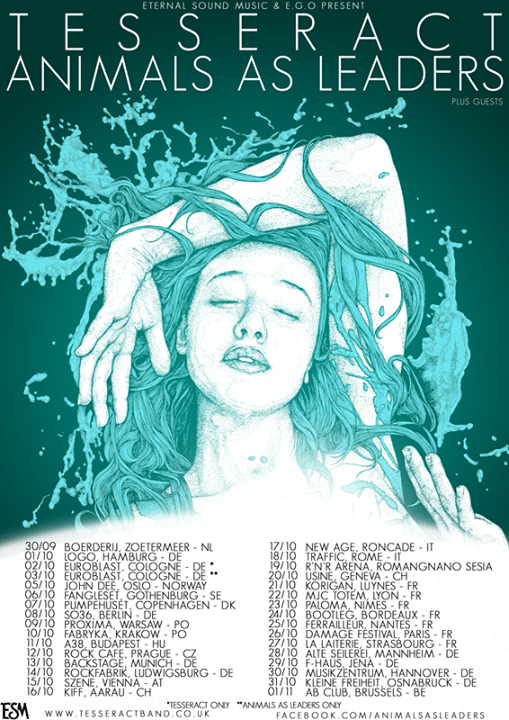 Get a chance to hear it live as TesseracT and AAL tour Europe together this autumn! We toured North America with AAL a few years ago on the Saints and Sinners tour and had a fantastic time with them. So, we’re really looking forward to hitting those European roads with them and showing them all the delights that Europe has to offer. Rain. Wind. Sausage. Check the poster below for the dates. Read Prog Sphere‘s interview with Animals as Leaders‘ guitarist Javier Reyes here.